Untamed wilderness. Sounds both ominous and exciting. 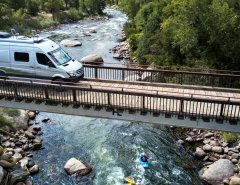 It’s hard to know what designers at Keystone RV had in mind 15 years ago when they released the first Outback travel trailer, but they certainly were thinking of out-of-the-way adventures that didn’t sacrifice comfort and convenience. 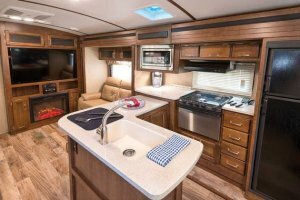 This theme continues with the 15th-anniversary Outback Super-Lite 332FK, a great couples’ floorplan, which, with its standard Arctic Barrier Package, is designed to take occupants comfortably to their favorite destinations, whatever the weather. 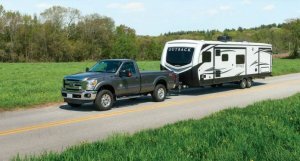 The 2018 Outback 332FK is a travel-trailer version of the Keystone Montana 3820FK fifth-wheel we reviewed in the August 2016 issue. The most striking feature is the automotive-style windshield behind the front dinette. The dark-tinted windshield affords a commanding view that opens up the whole kitchen and dining area. 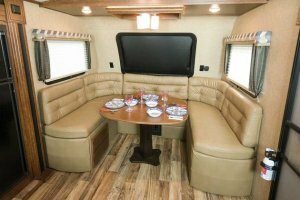 The dinette, one of the most comfortable in the RV industry, isn’t convertible for sleeping, although the windshield is easily darkened by a black pull-down shade. The dinette benches are well utilized, however, providing access to the passenger-side storage compartment, the 35,000-Btu furnace, the 6-gallon gas/electric water heater and electrical-system components that include the 75-amp converter. 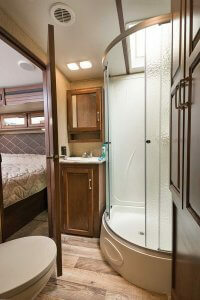 Travel trailers have had front windows for years. The problem is that the window needed to be covered by a rock guard during travel to keep from being damaged by road debris. When open, the guard acts as a window awning, but it can obscure some of the view, requires maintenance and offers a place for wasps and hornets to nest. Consequently, the use of front windows with rock guards slowly became extinct. In a game changer, Keystone rolled out two 2016 fifth-wheels with the patent-pending Guardian PrivaGuard windshield. For 2017 Keystone added PrivaGuard windshields on the 15th-anniversary Outback line of travel trailers with the 332FK and 333FE floorplans. 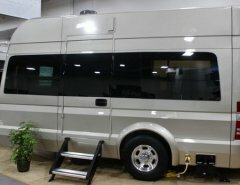 The fully laminated automotive-style windshield, which is made in the USA, is designed to be installed in a reinforced fiberglass cap in the same way a windshield is installed in a motorhome. In this case, the windshield is deeply tinted, providing privacy and excellent solar performance. It serves as a picture window, allowing people inside to see out, yet no one can see in during the day, according to Matthew Eder, general manager of Guardian’s Custom Glass Solutions. Above the dinette is a wood ceiling fixture with LED accent lighting and a three-globe chandelier. 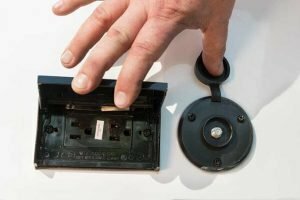 As is common with RVs these days, lighting throughout the Outback is LED, and most of the fixtures are standard single or dual housings with a sliding switch. Flooring is vinyl with an attractive gray-plank pattern, except for the carpeted bedroom. Housed in a long streetside slideout, the adjacent kitchen is nicely equipped with a Dometic 8-cubic-foot refrigerator and an Atwood range with a 17-inch oven. The 900-watt High Pointe turntable-free microwave features Diamond Wave technology that, according to the company, cooks food evenly without spinning. This also means the glass turntable won’t rattle and dislodge every time the trailer takes a trip. Well-made cabinets have solid-maple doors and ample solid-surface countertops that include an L-shaped extension. The under-mount double-bowl sink features a high-rise pull-out faucet. The layout is compact, but the sink and appliances form the ideal kitchen triangle, making cooking chores easier. Across from the kitchen in the passenger-side slideout is a large pantry with tons of room to store everything from pots and pans to culinary treats. When extended, the opposing slideouts expand the space for not only a convenient kitchen but also a nicely equipped living area. The test trailer had reclining theater seating in the passenger-side slide and a pull-out sofa sleeper in the driver-side slide. The rearward wall contains an entertainment center with a 50-inch LED TV, a DVD-stereo system and an electric fireplace, all set in an attractive cabinet with plenty of space for components, DVDs or whatever you wish to store. Two cubbies, one with a USB charging station, are tucked above two cabinets with solid maple doors. Below are two more doors with frosted-glass inserts that match the cabinets above the sofa sleeper. 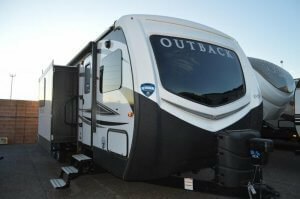 While the Outback Super-Lite 332FK is ideal for couples, there is minimal additional sleeping space. The pull-out sofa sleeper is full, not queen size, so two adults may not fit on it comfortably. 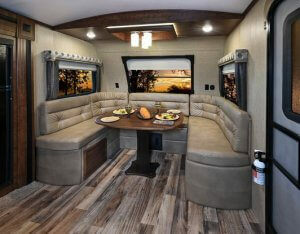 However, there is more than ample space for entertaining and enjoying meals with friends, courtesy of the U-shaped dinette, without the constricting feeling some standard RV dinettes impose. Movies should sound pretty good with the iRV Technologies DVD stereo with 2.1 surround in zone 1, although the test unit’s zone 1 was wired to the bedroom. Zone 2 receives standard stereo audio. The third zone is interesting, in that it has an independent-control function, which means it can play different media than the other zones. While controlling this takes some acclimation, it’s a great feature that allows the outside speakers to play music, even streamed wirelessly through a Bluetooth device, while those inside enjoy different tunes or stereo-TV audio. The system features two HDMI outputs and one input, and features an audio return channel (ARC), so the audio of whatever source is being watched on a compatible television, whether over-the-air, satellite or cable TV, will play through the stereo via the HDMI ARC. The stereo is also controlled by a proprietary smartphone app, allowing the user to stream music as well as control many functions. Speaking of smart devices, the Outback Super-Lite comes standard with the ASA Electronics iN-Command system. This trailer-automation system controls the slideouts, awning, water heater, tank-level sensors and most of the lighting through a wall-mounted touch-screen display or a mobile app. The ability to control the slideouts and awning from outside while being able to check clearances is a convenient feature. So is being able to turn on all the lights from the tow vehicle during a nighttime arrival. In the 332FK, the display is mounted to the hallway wall outside the bathroom door. The side-aisle bathroom in the 332FK is good sized. The shower has a rounded front with a frosted-glass surround and two sliding doors that meet in the middle, held tight by a magnetic strip. 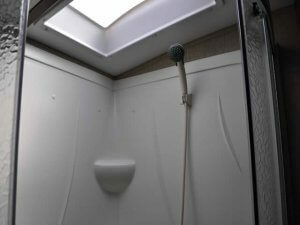 The shower has the usual shelves and ample room for even a 6-footer to feel comfortable, especially with the skylight overhead. The vanity and sink are compact but work fine. A ceramic Thetford toilet sits kitty-corner between the doors. The bathroom features a large linen closet with plenty of room, and hooks on the doors provide a place to hang damp towels. 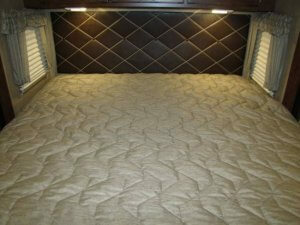 The carpeted master suite is as nice as any we’ve seen in a travel trailer. An entry door on the passenger’s side provides outside access, and a convenient countertop and wall full of cabinets, drawers and a closet are on the same side. The cabinetry continues its elegant look and feel from the living area. Drawers are large enough to hold a good amount of clothes, and the closet is adequately sized for two. With its nicely sewn padded-vinyl headboard, the standard king bed will appeal to many, but its area-filling size in the slideout eliminates space for any type of bedside table. The aforementioned counter across from the bed has a USB charging station and 120-volt AC receptacles, but to have a smartphone, CPAP or other electronic device close at hand while in bed requires leaving them on the floor, placing them on the window valance or setting them inside the over-bed cabinet, which will require the use of an extension cord from the outlet on the back wall of the trailer or the bathroom wall on the other side. The bedroom has excellent ventilation, with a roof vent, jalousie windows by the cabinets and across the back wall, and a single window on each side of the bed in the slide, in addition to the exterior door. As mentioned, this trailer comes with the Arctic Barrier Package, which, according to the company, features R-14 roof insulation, R-7 block foam in the laminated side walls and R-10 block foam in the laminated floor. The heated and enclosed underbelly protects the tanks, piping and waste valves, allowing an extended travel season in frosty conditions. The upgraded frameless windows are dark-tinted and single-pane, which means they have an insulation R-value of about 1, which offsets some of the commendable insulation elsewhere in the trailer. Dual-pane windows would be a logical option, in light of the Arctic Barrier package promoted in the selling literature. 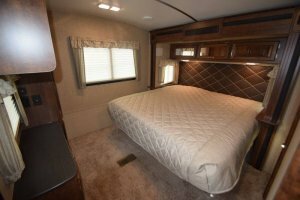 The trailer is equipped with a 15,000-Btu Coleman-Mach ducted air conditioner and 50-amp electrical service, and wired for a second air conditioner in the bedroom to replace the roof vent. Experience has shown that any RV out in the bright sun on hot days will heat up, making cooling systems less effective, and with a trailer this size, the second air conditioner would be a good option in these conditions. During our test, the trailer was in bright sun, including two days of temperatures from 90 to 95 degrees Fahrenheit, and the single air conditioner wasn’t quite enough. The exterior of the trailer is clad in pearl-white gel-coated high-gloss fiberglass and attractive appliqués. A textured, diamond-pattern lower panel (called a J-wrap) adds a nice touch and reduces unsightly dents and scratches that are commonly found in this area after time on the road. 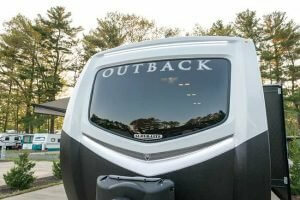 For this floorplan, the most striking exterior feature is the front cap, which utilizes a unique spray-on bed-liner rock guard on the lower half and the Guardian PrivaGuard windshield above, with the Outback logo emblazoned across the top. Small dot-style LED marker lights enhance the design. The windshield is durable and not only looks appealing but opens the front of the trailer to a panoramic view while making it difficult for people to see inside during the day. 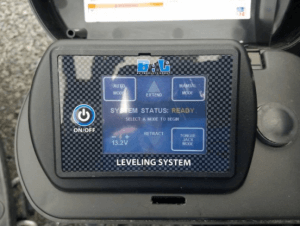 The Outback has an optional BAL 7.0 auto-leveling system ($2,603) that is controlled by a touch-screen panel on the driver’s-side front corner of the trailer. Mated to the BAL NXG Frame, the system uses a special A-frame jack, two straight-acting jacks behind the wheels and four lateral-arm stabilizer jacks to level the trailer by supporting its full weight and prevent movement. It’s a good idea to practice with the A-frame jack because it has a long extension foot, and the travel can be exceeded if the ground is off level enough. A few blocks of wood as leveling jack pads can help address this potential problem. On this floorplan, the plastic touch-screen door opens right in front of the water-heater exhaust, which could melt the door and cause damage if the water heater happens to be firing while using the leveling controls. For this reason, it’s important to keep the touch-screen door locked when not in use. A small bead-chain holdback would help eliminate this issue. That said, we operated the system numerous times, and it is a great convenience that works well. 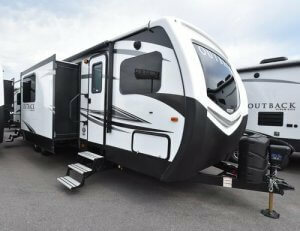 The 332FK is equipped with a 19-foot Dometic electric awning with an LED light strip at the top. This awning deploys above the passenger-side living-room slideout and can’t be tilted or otherwise adjusted without the top of the slide protruding into the fabric. This is common on RVs with a passenger-side slide, and we prefer a larger awning that extends to the rear door of the trailer to provide more under-awning space. 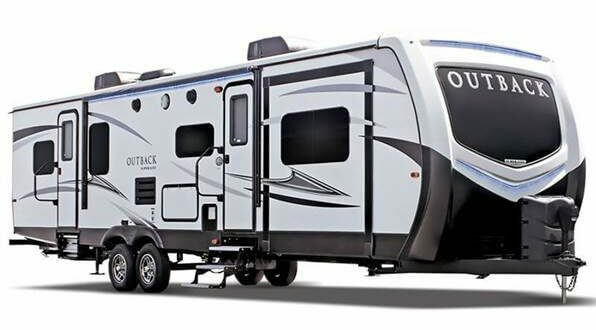 The outside power outlet and TV connection are located toward the back of the trailer, so use of a TV under the awning will require an extension cord and a long coax cable. put too much weight on it. The water and sewage utilities are common and protected from the outside elements to some extent. The water inlet, tank-fill valve, black-tank flush and cable- and satellite-TV inlets are conveniently housed in a side-wall utility compartment. The trailer has one black and two gray tanks and uses remote cable-style dump valves with handles up on the frame. While the rear discharge is pretty easily accessed, the front gray tank for the kitchen sink is way up under the front slideout and requires crawling under the trailer to access when the slide is extended. This is common for this kind of design. Connecting a hose to it before deploying the slide is recommended, using a wye fitting and a couple of shorter hoses like Camco’s Rhino Extreme setup. Replacing the dump valves with electric models will make dumping a lot easier. Exterior storage is adequate, with a smaller compartment on the front passenger’s side, which is lit and contains the battery-disconnect switch. The compartment is located under one of the dinette benches and is large enough for hitch items and some patio essentials; we fit four large bag chairs in it. 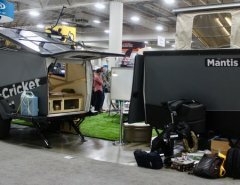 This model has no cross-trailer storage, so longer items like fishing rods and flag poles will have to reside inside the trailer or the tow vehicle. There is a much larger carpeted compartment in the rear slideout under the master bed that can hold the 50-amp power cord and other bigger items. High on the to-do list would be replacing this carpet with water-resistant flooring, as outdoor compartments with carpeting tend to hold water and odors, and will eventually rot. Overall, we really liked the 2018 Outback Super-Lite 332FK for its solid build quality, excellent equipment list, overall storage and upscale appeal. This floorplan is ideal for couples who like to travel in comfort and style, and entertain friends easily. Redacted from an article by Trailer Life, by Donya Carlson, Sept. 2017, and information and images from Keystone RV.